To ensure you receive our reply, add us to your list of safe senders. Pavones is located on the southern Pacific coast of Costa Rica, about 200 miles (320 kilometers) from the capital city of San Jose. Most of our guests and students fly into the scenic town of Golfito (about 1.5 hours from Pavones) and take a taxi or rent a car from there. The road into Pavones is not paved. An adventurous few choose to drive from San Jose (about 6 hours) or take a local bus from San Jose to Golfito or Paso Canoas. 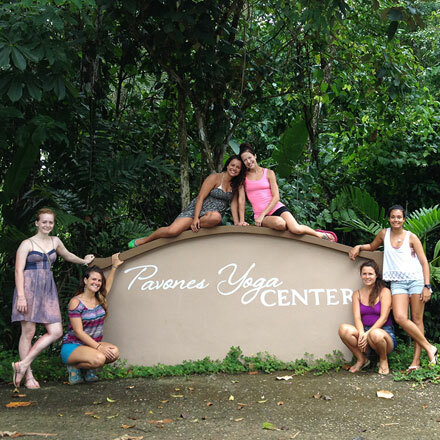 Once in Pavones, Pavones Yoga Center is located a half mile (800 meters) from the Rio Claro grocery store on Alta Mira Road. Ours is the first (and only) concrete driveway on the left side once you've cleared the hill. Alta Mira is a steeply pitched dirt road. Getting to the studio requires a vehicle with 4WD, especially in the rainy season. Walking is an option, but keep in mind that 'Alta Mira' roughly translates to 'High Lookout' and some of our students joke that we live up a mountain, not a hill. Our road is famous for it's breathtaking views but be prepared to sweat on the climb. Limited parking within our gates is available to overnight guests and, on a space-available basis, to yoga and spa guests.